When light strikes a photovoltaic panel, part of the energy supplied by the photons is lost as heat instead of being converted into electricity. Masao Nakamura and colleagues from the RIKEN Center for Emergent Matter Science have discovered a way to capture this waste heat with a new type of solar cell that generates multiple charge carriers from a single photon. 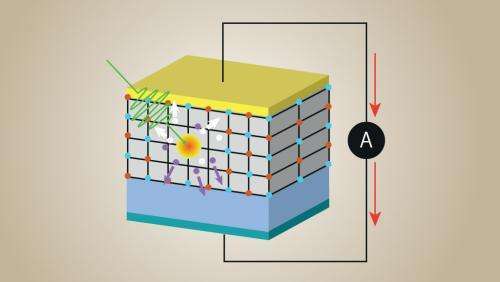 The concept relies on producing an interface between surfaces with different electronic properties, called a heterojunction. Recent studies have shown that when certain inorganic ceramics known as perovskite oxides come into contact with each other, photovoltaic phenomena can emerge due to competition between non-interacting, semiconducting electrons and a phase in which the electrons work together—known as a correlated system. However, building solar cells based on perovskite heterojunctions is challenging because electric fields at the interface can change the oxide behavior in unexpected ways. Nakamura and his colleagues realized that they needed subtle control over the heterojunction structure to find the best balance between correlated and semiconducting electron phases for solar-cell applications. They selected a photoresponsive correlated material, lanthanum strontium manganese oxide (LSMO), and deposited it on a semiconducting perovskite, niobium-doped strontium titanium oxide (Nb:STO), using a pulsed laser. By changing the surface orientation of the Nb:STO, the team grew two differently distorted LSMO crystals: one that formed rectangle-like angles with the Nb:STO interface, and a more strained phase with a tilted structure. Electronic measurements revealed that both types of LSMO–Nb:STO junctions had semiconducting properties. However, when the researchers applied magnetic fields to the interface to test for correlated electrons, they found that the tilted crystals had a significantly enhanced photocurrent compared with the straighter LSMO phase. Nakamura explains that this is clear evidence that small structural and chemical changes to perovskite oxides can induce critical interfacial phase competition in these materials. To investigate the mechanism responsible for the magneto-induced photocurrent, the team performed a series of field- and temperature-dependent transport measurements. These studies suggested that for the tilted crystal phase, a small correlated energy gap appeared at the LSMO–Nb:STO interface. This small-gapped state is favorable for the photo-induced phase transition and can initiate multiple carrier generation. Nakamura notes that while this technology is at an early stage, it can guide development of next-generation, intrinsically effective photovoltaic devices. "Our energy conversion efficiency is still low, but by tuning the material composition and device structure, we expect to improve upon and realize a correlated electron solar cell," he says.